I don't think this would be anyone's first choice today, but even so, this isn't a dull recording, and it does have its attractions. The sound, while not at all realistic, is vivid, with a good sense of stereo spread, although, as Darrell complains, opportunities to realize antiphonal effects – for example, in the "Tuba mirum" – don't receive the expected follow-through. The four soloists are brought very far forward, and seem to be in a completely different sonic environment than the orchestra and chorus. The advantage of this is that it lets them pay more attention to nuances and less to simply being heard over the orchestra. Sometimes the chorus is forward too, and at other times so far back one almost doesn't realize that they are singing. These conditions potentiate a Requiem that is more human than operatic. With humanity comes human failings, however. All of the singers have issues with pitch, although Bijster is the most challenged, sometimes flatting distressingly (as she runs out of breath?). Even the Latin pronunciations are somewhat haphazard – Bijster's insistence on "shaylee" for "coeli" and "timmy-o" for "timeo" made me wonder if perhaps this wasn't the Dublin version of Verdi's masterpiece. Still, I like the singers' youthfulness and overall sensitivity. Pritchard doesn't sound like one of those "biker" types who make their performances of Amneris and Eboli so entertaining, and if Wolovsky doesn't have the most imposing bass voice, he is persuasive in his solos – the kind of guy I would want on my side when the question arose as to whether or not I would be saved. Walter Goehr is a Rediscovery favorite. He was born in Berlin but came to England in the 1930s to avoid persecution by the Nazis. He made many recordings, particularly, late in life, for the Concert Hall label. Many of these recordings were made quickly, with few opportunities for rehearsal and second takes – check out the clam in the "Tuna mirum"! – and I suspect that many of the shortcomings in the present Requiem can be attributed to that policy. What is more important is that Goehr was a professional in the best sense of the word, and could achieve good results even under less than ideal conditions. That is apparent here as well. 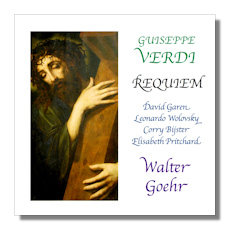 This is fiery Verdi Requiem when it needs to be, but it also is flexible and musical. There's no sense that Goehr is using the music just as a vehicle to make a big, self-impressed noise. Rediscovery's meticulous remastering process apparently was unable to remove the passages of sonic congestion and peaking, but the enjoyment inherent in this recording is by no means spoiled by the less than perfect sound. (Too bad the release's cover misspells the composer's name!) This pair of CD-Rs is available from www.rediscovery.us for $20, which includes shipping. For the Verdi Requiem collector who has everything, here's something he probably doesn't have!